New millimeter-wave waveguide PIN diode switches provide low insertion loss from 3.5 dB to 5 dB. Pasternack, a leading provider of RF, microwave and millimeter wave products, has launched a new line of E and W-band PIN diode waveguide switches. These SPST and DPDT millimeter wave waveguide switches are reflective designs that operate over an ultra-broadband frequency range with fast switching performance. They are ideal for telecommunications, test instrumentation, research and development and radar front end applications that may involve general switching, receiver protection, pulse modulation and/or antenna beam switching. Pasternack’s new series of single-pole single-throw (SPST) and double-pole double-throw (DPDT) PIN diode waveguide switches consists of four models with fully integrated WR10 and WR12 waveguide ports covering popular E-band (60 to 90 GHz) and W-band (75 to 110 GHz) frequencies. Switch circuits integrate low loss Fin-line assemblies with high performance GaAs beam-lead diodes that results in 4 dB typical insertion loss, greater than 25 dB of Isolation and fast switching speed < 300 nsec. These waveguide PIN diode switches incorporate TTL driver circuitry with an SMA connector control port for ease of use. All models require a dual voltage bias of +5 / -5 Vdc and have a maximum rated CW input power level of 0.5 dBm. Rugged MIL-grade compact package configurations combine both switch and control module packages and offer maximum performance and reliability over a full temperature range of -55°C to +85°C. “Pasternack’s new line of millimeter wave SPST and SPDT PIN diode waveguide switches offer exceptional broadband performance, fully integrated WR10 and WR12 waveguide ports and innovative TTL driver circuitry. Designers will find these models extremely desirable for prototype and proof of concept applications because they are in stock and can be shipped immediately with no minimum order quantity,” said Tim Galla, Product Manager at Pasternack. Pasternack’s E and W-band PIN diode waveguide switches are in stock and ready for immediate shipment with no minimum order quantity. 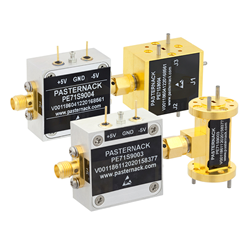 For detailed information on these products, please visit https://www.pasternack.com/pages/RF-Microwave-and-Millimeter-Wave-Products/e-and-w-band-waveguide-pin-diode-switches.html.